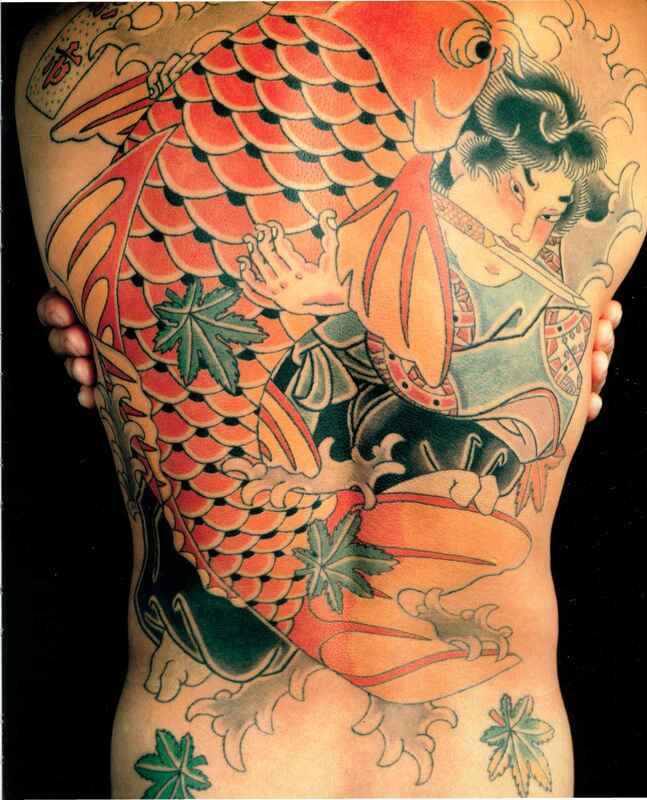 Kintaro again in mortal struggle with the powerful carp. This time he is older, armed, fully clothed, and tied with a bow at the obi (in lieu of the haramaki). The maple leaves suggest the passage of time or aging. 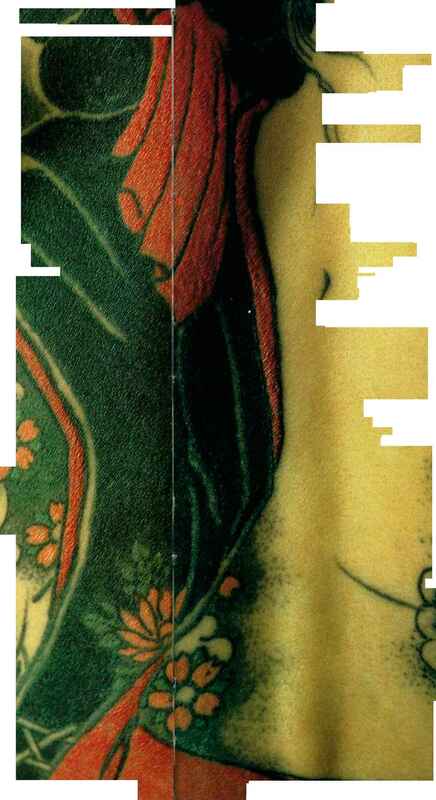 Horiichi's signature chop, or han, is at the top left of the full-back tattoo. PERSEVERANCE Horijin tells here the famous Chinese story of the iioness mother who tossed her favorite, still suckling cub down a ravine to train and encourage him to climb back to her. It is a legend of the survival of the fittest and symbolic of the Confucian ideal of parents sacrificing feeling so that their offspring may strengthen. 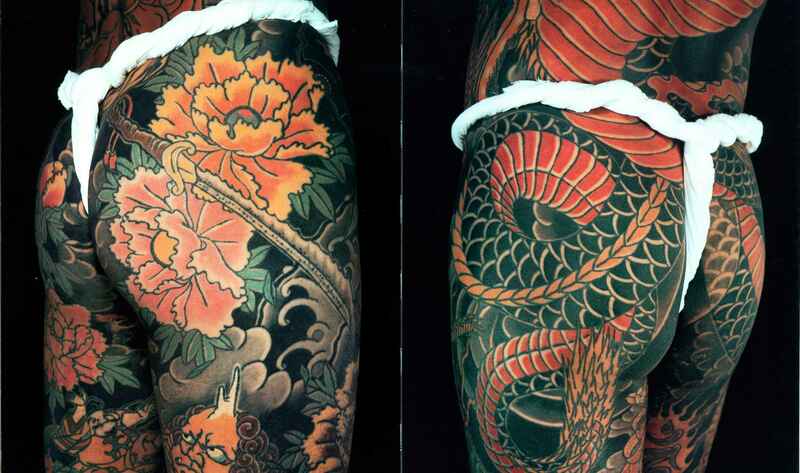 PEONY AND SWORD AND SERPENT'S TAIL (overleaf) Horiyoshi III combines opposites in the contrasting tattoos of the sword and the peony, indicative of strength and beauty in control of the horned demons of this world, and the serpent and the rope, so similar yet so unalike. 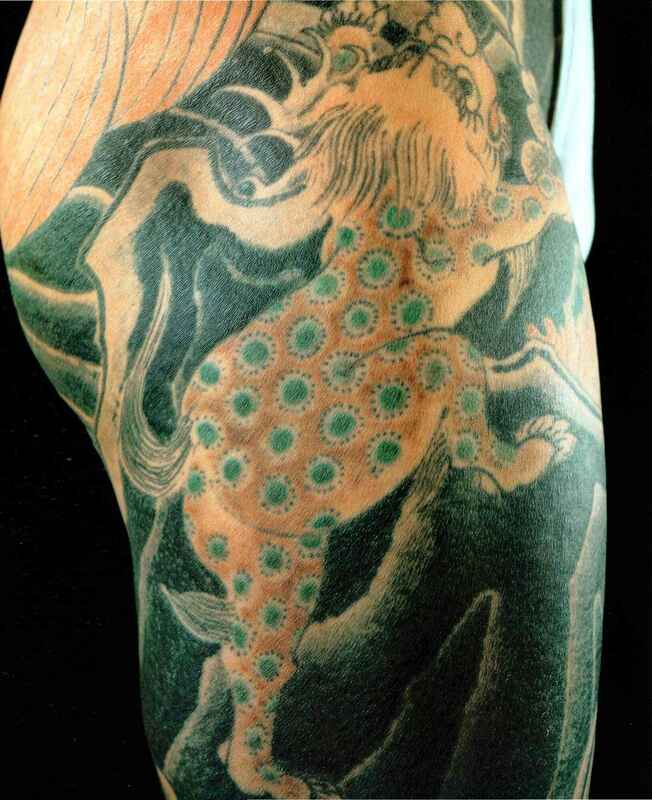 STRENGTH In this tattoo by Horijin, Kurikara Kengoro, one of the heroic outlaws from the Suikoden tales, has set out to oppose evil and correct wickedness. This time he is protected by the Buddhist deity Fudo. The rectangular cartouche (upper left) names the band to which the Men of the Marshes belong.